Proud moment for Round Table International and Round Table India. 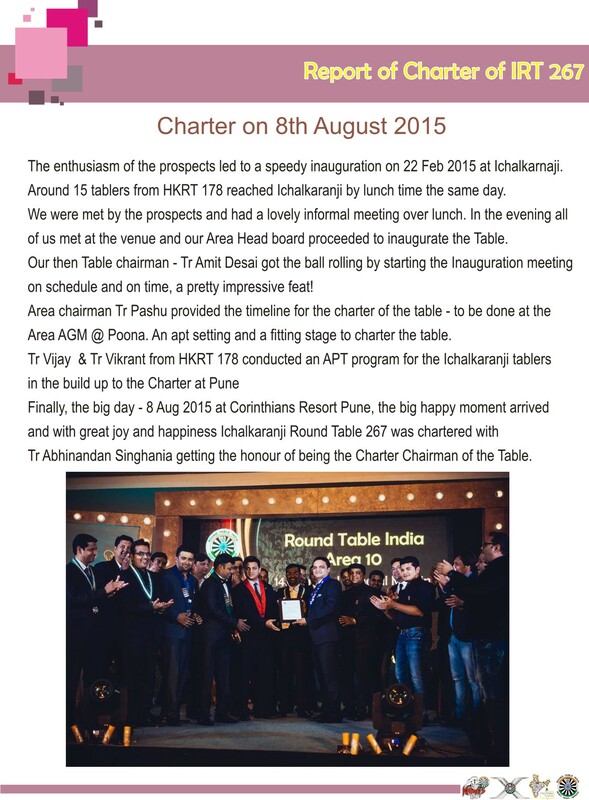 Extension of Round Table Perth 4 by Round Table India and Round Table Nepal. 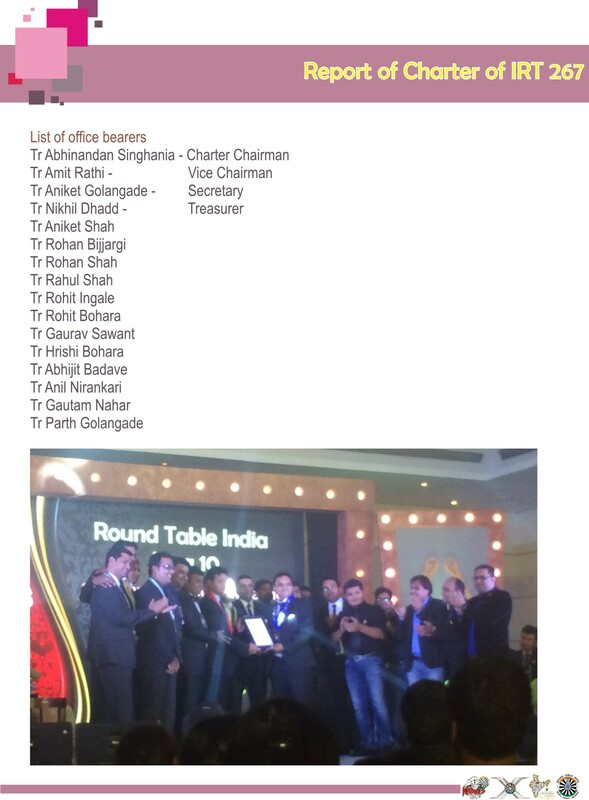 Thank you RT 43, RT 89 and RT 318 from India for coming forward as sponsor tables for Extension of Round Table Perth 4. Big thanks to ASPA Chairman Ranil Samarawickrema, Chairman Delhi Mid Town RT 43 Ashwani Mundhra, Chairman Secunderabaf City RT 89 Ashish Sonthalia, Chairman RT Sitapur 318 Ashish Singhania. The extension would not have been possible without the efforts of National Vice President RT India Piyush Daga. 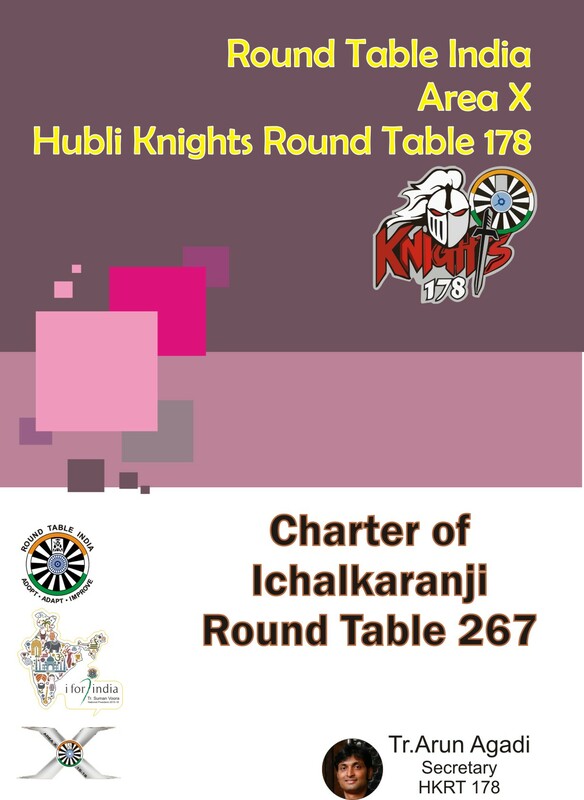 I would like to welcome Siliguri Round Table 332 to our Round Table Family. It was an absolute delight to be a part of the charter ceremony. Congratulations Siliguri Ace RT 232 for extending the brotherhood. It was great to have the presense of all the 4 tables of siliguri and really appreciate their participation. Gantok may be getting very cold but the warmth of Gantok Round Table is something that you have to experience. Thanks Chairman Gantok RT 301 Pravin for driving me all the way from siliguri to gangtok and then taking me around the hills, which are some very beautiful memories for life for me. You all are a super fun bunch of guys. We also had the inauguration of a computer lab in a remote school at the outskirts of Gangtok by RT 301and a benches donation programme in Siliguri by newly formed Siliguri Falcons RT 332. I once again congratulate the entire team of area 14 and Chairman Dhiraj for a fabulous job. Thanks Aditya, Praveen, Luv and dhiraj for being there through the journey. Finally its 18th December and i head back home after visiting Kolkata, Mangalore, Shivamooga, Chikmangalore, Sakleshpur, Mysore, Silliguri and Gangtok. Been a very exciting experience. Most importantly it was a great chance to meet so many tablers across these cities. Bellary Vikings Round Table 152 induct 6 new Members to their BVRT Family. “Extension Of The Association , A Very Important Facet In Round Table India As We Are One Of The Most Transient Organisation Where In Members Retire At The Age Of 40 So There Is A Constant Need Of Extension To Bring In New Members To The Family And Also New Blood Means New Ideas , New Avenues And New Opportunities. It’s Just Not Numbers That Matters To Us , We Look For Men Who Have It In Them To Walk The Extra For This Family With A Big Agenda “Service Through Fellowship” Which One Of The Most Meaningful Agendas A Person Can Have As It Simply States “ Let’s First Be Brothers To Each Other And Then Make The World A Better Place To Live In. When The Idea Popped Up To Extend Our Table We Looked Into The Requirements Laid Down By Round Table India And They Looked A Bit Length. The Journey Of 6 Contact Meets Which Includes Fellowship , Business Meets , Community Service Activities And More Made Us Realise That These Requirements Where In Place Just To Help Us To Get To Know The Prospects On A Much Better Level And By The End Of The 6 Meets The Prospects Were As Comfortable With The Rest Of The Family As They Were With The Proposers And Finally At The End We Were Glad. The Journey Of Mr To Tr Is A Privileged One And Yes Even The Table Felt Privileged To Have New Distinguished Men Amongst Its Family Who Will Join Forces To Contribute To Change And Also Share Our Moments Of Happiness/Sadness. Bellary Vikings Round Table 152 As Memorable Day As We Welcome Six Gentleman Who Will Know Have A Privileged Prefix Of Tr Before Their Names And Also Will Get To Carry The Good Repute Of Round Table India Wherever They Go. A dream moment narrated straight by Area 8 Extension Convener LMF Tr. Khushal Bhargava. The above 4 magical points still echo my ears whenever I explain tabling to any individual, BUT the last point motivate and energise me the most, hence when our current Area Chairman Tr. Taran asked me as to which convenership I wish to choose I opted for Extension. The dream that every NP,Area Chairman and Table Chairman look was laid down from day one of the new tabling year 2017-18 when the baton of AC was passed from Tr. Siddharth to Tr. Taran. It was a heartening moment that the first un-official meet was conducted in presence of IPC Tr. Siddhartha Gupta at Moradabad and Sitapur in the month of July 2017. Post that there was no looking back. It is with the coordination of Area 8 Head Board and both sponsor table LMRT 255(for both Sitapur & Moradabad) & BRT45(for Moradabad) “a dream became a reality when both tables Sitapur and Moradabad were inaugurated on 23rd Dec,2017 in presence of NVP Tr.Dhruv Dalmia,National Ext. Con. Tr. Chirag Sethi,National Project Con. Tr. Moriya Philip,Area 8 Head Board and representatives of 9 tables. The momentum was on and in almost every 10 days a contact meet was executed and extension process was in full swing towards the D day. We did LAPD sessions where Sitapur LAPD was taken by AC Tr. Taran accompanied by AST Tr. Suyash and Moradabad was taken by HT Sq.Lg. Aditya Murty and AST Tr. Suyash Kapur. They also did community projects before the Charter. The ball was rolling and April 7th was finalised as the Charter day of both tables together in Lucknow.This is for the first time that in the history of Area 8 and very few places in RTI that a Twin Charter was a reality. The entire process took 9 months of continuous contact meets where we even failed to conduct few meets but finally we made it. The meets include regular guidance and motivation to new tables by Area HB Tr. Taran,Tr. Rishabh,Tr.Suyash,both sponsor table HB and National Extension team. As a floor tabler I learnt loads of things from the process which made me more confident as an individual in terms of responsibility,leadership and torch bearer to 31 new tablers. The day arrived(April 7th,2018) and after noticing the the guest list which included NHB,AHB, tablers from Area 8 and various other Areas, it was a feeling as if either AAGM or some National event is taking place. LMRT255 jointly with Sitapur and Moradabad left no stone unturned to make the day a historic one. Since morning LMRT planned Bhumi Poojan of their first FTE project, then in afternoon we planned sports Wheelchair donation to UP wheelchair team and in the night the Grand Charter. The Twin Charter had the guest list including Natioanl President Tr. Chris,NVP Tr. Dhruv Dalmia,National Extension Conveners Tr. Ajmal Dastagir & Tr. Chirag Sethi, NPC Tr. Moriya Philip, Area Chairman Tr. Taran,AVC Tr. Rishabh, AST Tr. Suyash,IPC Tr. Siddharth,NHT Sq. Lg. Rajpreet, HT Sq. Lg. Aditya, Tr. Nikhil Sethia from Kolkata,Tablers from KCRT 111,LRT 136,LTRT 207 and BRT 45 along with families of SRT 318 & MRT 319. Each NHB member and AHB member praised the efforts for forming two tables together and awarded Tr. Robin,Tr. Siddharth,Tr. Khushal with President medal and Area 8 Star award for the the addition of twin tables in Area 8. The stage was set and it was the time to present the Plague Card when Tr. Chirag played a prank of not receiving the Plague cards of both tables. After the prank was successful both the Charter Chairman Tr. Ashish & Tr. Shalabh along with their teams were called to accept the association letter. In front of 75+ tablers and guests the history was created and two new tables with 31 new members were inducted in RTI family. The celebration started with opening of champagne and ended with grand social till 4am in morning. Special thanks to the wonderful sergeanting of Tr. Yugesh Sethia who made us laugh with his awesome skills. I wish to extend special thanks to the Area 8 Head board,National Extension team,Tr. Abhishek Kapoor ,Tr. Rajit ,Tr. Siddhartha Khanna,Team SRT318,MRT319 and Tr. Robin who made the journey successful for a Grand Charter. Relax friends! All of you must be imagining, thinking, day dreaming and of course dreaming. Seventeen means our table, Active is Active Acres the venue and Pajamas the theme for the fellowship ‘Pajama Party’. All imaginations squeezed out? Come back to stable mode friends! It was an honor for the table to be invited by our honorable Area IV Chairperson Cr Shweta Poddar and Vicky donor, oops; sorry our blood bank and dear friend Tr Manish Poddar at their lovely house for dinner and halla-gullah. Seventeener’s on the seventeenth floor. What a coincidence? Right floor number chosen by the Poddar’s! The master bedroom was occupied by all the girls and was a strict no entry for the boys. We do have some genius’ amongst us and we could hear their ‘girly’ conversations. The kid’s room was occupied by our youngest twinkler’s Ms. Jain & Master Joshi both of them around three months old. The boys were left all alone in the living room which pumped in blood to all corners of the house. There was chit-chat going on everywhere. Discussions on business, social life, tabling activities, etc. made the whole house buzzing with ideas and thoughts to ponder. Out of the blue, we are surprised by the entry of birthday girl Cr Shweta Goel. All were happy to see her and were delighted to be with her on her special day. There was a mouth-watering layout out of different dishes all prepared in the house. A tremendous effort put in by Shweta. An unbelievable number of 33 friends present, starting the new epic fellowship year with a bang! 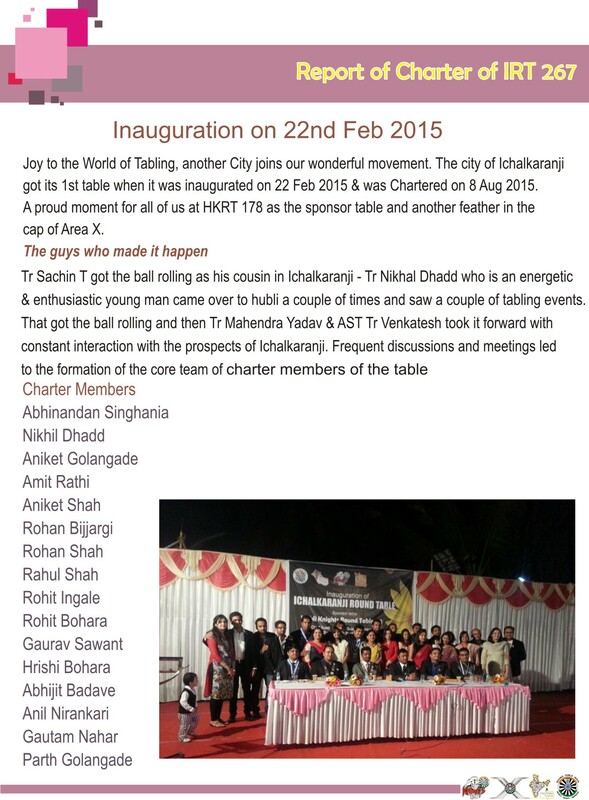 The Last table that was extended in Pune was eleven (11) years ago. This fact was a key driving factor for starting the journey of a new table extension in PCMC. Being local of PCMC, Chairman Yogesh was all the more determined to include extension in the plan for the year. Chairman Yogesh got an external extension team into place. The able team of Tr. Surabh, Tr. Anuj, Sq Leg Sanjay & Sq Leg Mukesh Ruparel was formed. Being the local from the PCMC, chairman Yogesh connected with a lot of contacts apart from referrals received from the few tablers of Pune tables. Contacts were introduced to the movement by sending a short video of RTI prepared specially for the PCMC extension and then all those interested were invited for the 1st contact meet on 31st October held at Hotel Kalasagar, in PCMC. 12, prospects with their better halves could make it for the meet. The formal part of the meeting was anchored by Tr. Sanjay who began by asking the guests to introduce themselves and to share a thing that they were passionate about. This was followed by an hour long presentation, filled with personal anecdotes, insight and humor that kept the guests engaged and interested in various aspects of tabling. Apart from breifing them about the history of RT, key aspects of tabling were also disscussed specifically from the angle of what the prospective could expect from becoming a part of this movement. Opportunity to Meet Like Minded People: RT membership consists of young & dynamic individuals who come various backgrounds and are leaders in their fields with a passion to make friends and serve the community. RT provides a readymade platform to interact with likeminded people. The fact that membership is by Invitation Only also added that exclusivity and charm to being a member of RT. Wholesome Family Fun and Fellowship: Being a family oriented organisation, RT ensures fun and fellowship for the whole family through various avenues like inter-table sporting events, theme socials, twinklers events etc. It was stressed that RT becomes a part of extended family and support system which of immediate relevance to most of the expats living in Singapore away from their families. Opportunity to Serve the Community: Aspects of FTE and Non-FTE service projects were discussed giving them a fair idea on the philanthropic activities that RTI is engaged in. Avenues for Self Development: the leadership and personality development aspect of tabling was discussed at length with information on various kinds of programs that are conducted within RTI. Sanjay shared his personal stories of various leadership opportunities that they themselves have experienced and the impact that it has had on their lives. International Fellowship: the uniqueness of touring the world, not as tourists buts as guests of the locals was discussed at length and the various opportunities for making friends internationally through World Meets, Number Meets, Mass Tours etc. Avenue for Networking: Asking them to think a little selfishly, Sanjay informed them that RT provided an ideal platform to network globally since there was an inherent trust that tablers have in working with each other. Also, as a member of an international organisation, they would have an access to the world of active and past tablers that were in the highest echelons of their individual fields. The presentation was followed by a Q&A session where queries of the guests were answered. The formal session was followed by fellowship wherein the guests got a chance to informally interact with each other over drinks & dinner. All the prospects liked the movement and showed keen interest on becoming part of the all new table in PCMC. Tr. Saurabh , Tr. Anuj, Sq Leg Sanjay & Sq Leg Mukesh . people into the tabling movement who are motivated and determined to serve the society. and not to mention we make great friends and contacts. and then we can officially go ahead with forming our child table.